Vanhankaupunginlahti, the fields of Viikki and the river Vantaanjoki form a unique nature site located right in the middle of Helsinki. The area’s flora and fauna are easy to explore, as the bay is circled by illuminated hiking trails and features several bird watching towers. In addition to this, there are nature trails for hikers in Kivinokka and Pornaistenniemi, complete with duckboards. 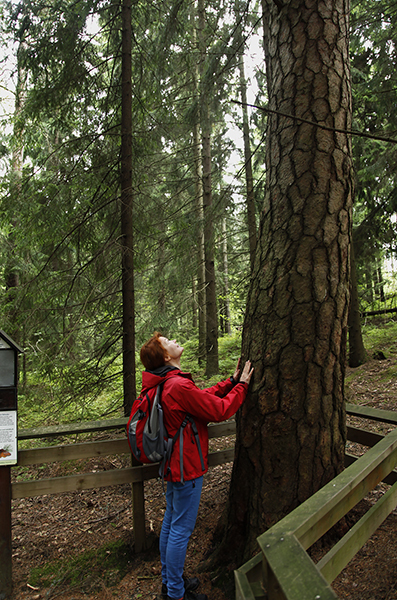 There is also a tree species trail in Hakala forest, which introduces visitors to different tree species from all over the world. 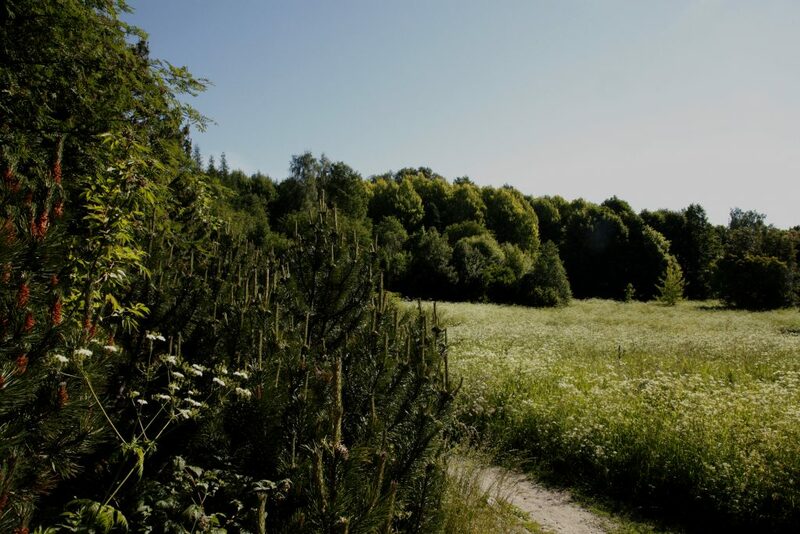 The City of Helsinki organises nature hikes to Vanhankaupunginlahti. More information on these and other hikes is available in the hiking calendar (in Finnish). Information on Vanhankaupunginlahti is also available in the Viikki brochure. The duckboards leading to the island of Lammassaari are being reconstructed to make them accessible as part of the joint EU-funded NATTOURS project between Helsinki and Tallinn. In addition to this, the project will also catalogue the local nature sites of both cities on the same website. In Pornaistenniemi, you can try your hand at fishing in the Vanhankaupunginkoski rapids or take a walk in the impressive herb-rich common alder forest. There is also a bird watching tower in the area that offers a great view of the ponds. Pornaistenniemi and the Vanhankaupunginkoski rapids have a deep connection with the history of Helsinki, as the city was originally established at the mouth of the river, along good transport connections. As such, the area is one of the most valuable parts of Viikki from a historical perspective, and garners a great deal of interest. Nowadays the area is favoured by recreational fishers, and in fact fishing and the migration of fish up the river to spawn are some of the area’s most interesting natural themes. The area also makes for an ideal hiking destination in the winter, when the frothing open rapids make for a beautiful sight and you might even see a white-throated dipper or a mink fishing on their shores. Pornaistenniemi is a mixture of the original nature of the area, old fishing culture and the old industrial culture that allowed Helsinki to grow. Pornaistenniemi is easy to access by bridge from the Arabia side. Visitors can start exploring the area’s flora and fauna right after the bridge on the rocky outcrop, where you can also find the main information board that provides more information about the area. From the main information board, the path descends towards the herb-rich forest. The nature trail’s own information board is located where the path splits in two. The path leading to the left is the start of the nature trail, while the path on the right takes you to the duckboards leading to Lammassaari and the end of the nature trail. The Pornaistenniemi bird watching tower is located along the nature trail between the ditch and the reed bed ponds. Lammassaari is accessible via duckboards from Pornaistenniemi. The island’s bird watching tower provides a great view of its managed meadow and water areas. The island also has a number of old buildings from the period in which it was used as a summer resort by the city’s working class residents. You can already see many of the bird species found among the reeds while walking on the duckboards, such as sylvids, rails and timalids. Once you reach Lammassaari, continue left to reach the path that leads to the bird watching tower. The path circles the northern edge of Lammassari, and the bird watching tower is located at the border between the common alder forest and the coastal meadow. Lammassaari used to be a famous summer resort, as a result of which there are many small villas on the island, similar to Kivinokka. Lammassaari is located in the middle of Vanhankaupunginlahti, and the reed beds surrounding the island are an important nesting area for birds. North of Lammassaari is the Ruohokari area, where a meadow has been cleared to serve as a nesting ground for waders. In the summer the area is grazed by cattle, which helps keep the grasses low. The flora and fauna of the pasture can be observed from the bird watching tower. 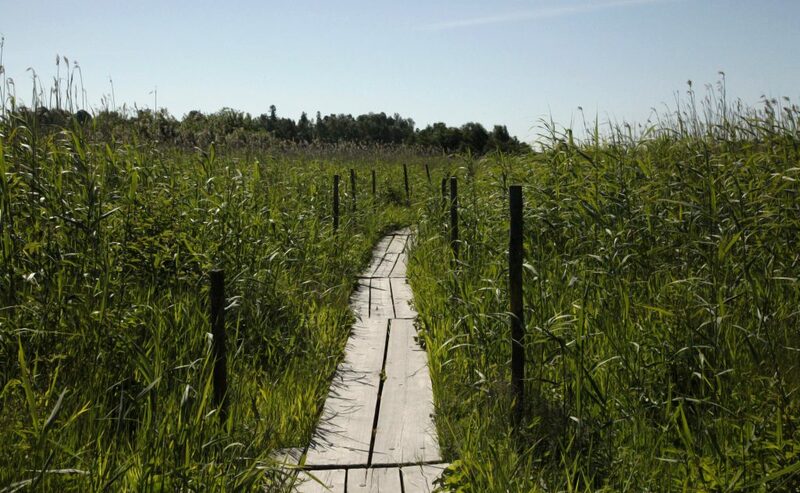 The Lammassaari area is a great place for observing the ecological succession of the shores, the impact of the old villa culture on nature and the numerous singing birds living in the sea of reeds. When moving around in the island, be sure to stay on the designated paths and do not trespass in the yards of the cottages. The forest of Hakala is located south of the Viikki fields, right near the bay shore. The Keinumäki and Hakala bird watching towers are great for observing the bird life of the Säynäslahti reed beds and the northern parts of the bay. Hakala forest also features a tree species path. Keinumäki can be accessed via the hiking trail circling Vanhankaupunginlahti, from the south-west corner of Hakala forest. Here you can also find information boards detailing the nature of Viikki. The path to Keinumäki leads across a meadow with junipers; the bird watching tower is clearly visible. At the base of the tower, there are some tables by which you can take a breather and enjoy your snacks. The tower itself provides a good view of the birds that frequent the ponds of Säynäslahti. The coastal alders are also home to woodpeckers. The Hakala tower is newer than the Keinumäki tower and can be found at the southern edge of Hakala forest, right by the shore next to the power line. The tower provides a good view of the northern part of the bay. Hakalanniemi is one of the most popular hiking areas in Vanhankaupunginlahti, and is easily accessible from the west, north and east. The shores of Hakalanniemi feature herb-rich common alder forests, and from Hakalanniemi you can also reach Gardenia and the Viikki research farm across the fields. Hakalanniemi can be considered first and foremost a bird site; in the coastal zone you can hear the high-pitched calls of the lesser spotted woodpecker, while spring evenings are often filled with the complex songs of nightingales. The area’s towers are ideal for observing water birds and waders. The rocks at Mölylä, rising on the eastern edge of Vanhankaupunginlahti, are a popular bird-watching spot, providing a good view of the bottom of Purolahti. The patch of forest behind the rocks is also a place well worth visiting, as it is home to a number of forest-dwelling species that are otherwise rare in Viikki, such as greenish warblers and red-breasted flycatchers. Mölylä forest is a notable remnant of old forest nature and easily accessible from the Herttoniemi residential area, making it an important recreational area. Fastholma juts out to Vanhankaupunginlahti from Herttoniemi, just north of the Saunalahti area. Fastholma is fairly eutrophic and there are a number of old villas in the area. The area also features a wide variety of plant and bird species. The Fastholma bird watching tower is located on the north-west corner of the Fastholma promontory. The tower provides a good place to observe the water birds swimming in the northern parts of Vanhankaupunginlahti in front lighting. The Kivinokka nature trail and bird watching platform are easiest to access from the direction of Herttoniemi. In the past, Kivinokka was the site of several summer camps for the workers of Helsinki, and even today there are a number of allotment gardens and cottages in the area. Kivinokka provides a good view of the southern parts of Vanhankaupunginselkä and also features a nature trail for the visually impaired. The nature trail is lined by old spruce-dominated forests, with patches of lusher woodland hollows in between. Kivinokka is an area that highlights the relationship between people and nature in Vanhankaupunginlahti. The area’s environments are quite well-preserved, despite being located right next to Itäväylä and densely populated residential areas. The area in front of the Kivinokka bird watching platform at the mouth of Saunalahti is home to Vanhankaupunginlahti’s great crested grebe colonies, in addition to which the area’s great reed warblers can often be heard singing in Saunalahti. The fields of Viikki and the teaching and research farm of the University of Helsinki are located right next to Gardenia. The birds and other fauna of the field areas can be observed by walking along the farm roads; walking in the fields themselves is prohibited when the ground is not frozen. You can start your exploratory hike from the corner of Gardenia by walking past the agricultural museum and continuing along the road to the farm road that leads to the eastern field area. In the middle of the field, there is another farm road leading towards a red barn and Hakala forest. The barn is a good place for taking a moment to observe the birds of the field area. After the barn, the road turns right and leads to the northern tip of Hakala forest. From here you can continue on to the Hakala or Keinumäki bird watching towers or turn back to Gardenia. The fields of the teaching and research farm are the most typical habitats of the Viikki area. The field landscape, dotted with patches of forests, serves as a buffer zone between traffic routes and constructed areas. The cows, barbed wire fences and northern lapwings that you can see here have been parts of the local landscape for decades. Viikki is also one of the few areas in the Helsinki metropolitan area where you can experience the sights, sounds and smells of rural life. Seeing a cow up close is a new experience for many residents of Helsinki. The arboretum area was created as part of the University of Helsinki’s forestry teaching. The arboretum serves not only as a place where you can broaden your knowledge of different tree species, but also as a site for biogeographical studies and examining the spread of different species over time. Even a short walk through the arboretum reveals just how similar related species growing in different areas are. The nature reserves of Vanhankaupunginlahti are subject to protection regulations. The aim of these regulations is to protect the natural values based on which the nature reserves were originally established. The same rules of conduct should be observed in the surrounding green spaces as well. According to the protection regulations, visitors are allowed to navigate the area’s paths by foot or bicycle. Forest areas without paths should be left undisturbed to serve as animal refuges and so as not to damage the vegetation. Moving about in the reed beds and open water areas of the nature reserve is prohibited when the water is not frozen so that the area’s birds can nest undisturbed. Pets must be kept on their leads to protect the environment and other visitors. The bird watching towers and rest stops of Vanhankaupunginlahti do not have waste collection containers, so visitors are expected to carry everything that they bring with them away from the area. You should always dress for outdoor activities based on the nature of the activity in question and the weather. When choosing what kind of shoes to wear, you should consider the diversity of Vanhankakaupunginlahti: the area’s paths range from forest trails and duckboards to pedestrian and bicycle ways. All of the paths can usually be navigated without fear of wetting your feet. One exception to this are the duckboards between Pornaistenniemi and Lammassaari, which can become submerged during high tides, particularly during the spring and autumn. In rainy weather, some of the forest trails can also become muddy. In the winter, the duckboards can also be slippery.